The new Tempstar® Ultra-Low NOx 80 percent AFUE gas furnace is here and it's built to provide consumer comfort with dramatically reduced NOx emissions. California's South Coast Air Quality Management District's (SCAQMD) Rule 1111 and San Joaquin Valley Air Pollution Control District's (SJVAPCD) Rule 4905 requires all furnaces installed as of October 2019 to meet 65 percent lower NOx emissions — from 40 to 14 nanograms/joule or less. With 65 percent less NOx emissions than current low NOx models, the Tempstar Performance Series N80ESU Ultra-Low NOx furnace is a more environmentally-friendly choice designed to meet or exceed the ultra-low NOx emissions requirements for California's SCAQMD Rule 1111 and SJVAPCD Rule 4905. For more information on California's SCAQMD Rule 1111 ultra-low NOx emissions standards, click here. For more details on California's SJVAPCD Rule 4905 ultra-low NOx emissions requirements, click here. Let's take a closer look at this Ultra-Low NOx gas furnace and why it's better for the environment, good for customers and just good business. Meets or Exceeds New Requirements: The Tempstar Performance Series N80ESU Ultra-Low NOx gas furnace meets or exceeds California's SCAQMD and SJVAPCD stringent ultra-low NOx emissions of 14 nanograms/joule NOx. 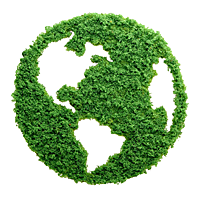 More Eco-friendly: This new furnace provides 65 percent lower NOx emissions than current low NOx models. Nitrogen oxides contribute to ground-level ozone, acid rain, water quality deterioration and global warming, as well as respiratory issues. Efficient: This new Tempstar gas furnace achieves 80 percent AFUE heating efficiency and includes a tapped ECM blower motor for system SEER, which can help reduce electricity costs. Quiet Operation: It has a fully-insulated blower cabinet for quiet operation. Dual Fuel Compatible: Customers can pair the Performance Series N80ESU furnace with a Tempstar heat pump and compatible Tempstar thermostat to create a dual fuel system. The ability to automatically switch between electric and gas heating can be a great defense against unpredictable utility costs. Durable Design: The Performance Series N80ESU gas furnace has a 20-gauge galvanized steel cabinet, baked-on urethane base coat and polyester top coat paint, and a corrosion-resistant heat exchanger without rivets for reliability and longevity. Financially Smart: The N80ESU is a SCAQMD and SJVAPCD ultra-low NOx-compliant furnace, which means you can avoid paying mitigation fees (fees can be as high as $400). If you install this furnace in California's SCAQMD, not only will you avoid the mitigation fees, but these models are also intended to qualify for a CLEANair Furnace rebate of up to $500 when filed at http://www.cleanairfurnacerebate.com, while funds last. Prepare for New Standards: Install Tempstar Performance Series N80ESU Ultra-Low NOx furnaces prior to the October 2019 deadline for California's SCAQMD and SJVAPCD ultra-low NOx emissions standards, and be better prepared for the new furnace requirements. Application Flexibility: This new furnace can be installed in upflow, horizontal left, horizontal right, or downflow orientations. Advanced Technology: The Performance Series N80ESU furnace has a single-stage gas valve, discrete-tapped ECM blower motor, variable-speed inducer motor, stainless steel heat exchanger, and pilot-free hot-surface ignition capability. Versatile Venting: Makes tight-fit applications easier. 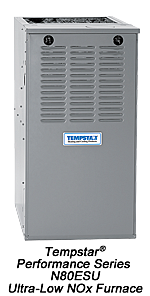 Compatibility: The Tempstar Ultra-Low NOx gas furnace is compatible with Tempstar programmable thermostats, current Performance Series and most mid-tier air conditioners and heat pumps. It's a more environmentally-friendly choice. It's customer-friendly. It's the new Tempstar Performance Series N80ESU Ultra-Low NOx gas furnace. It provides warm winter heat with 65 percent less NOx emissions than current low NOx models, and it's designed to meet or exceed California's SCAQMD and SJVAPCD ultra-low NOx emissions standards. 1 Timely registration required for 10-year parts limited warranty. Limited warranty period is five years for parts and 20 years for heat exchanger if not registered within 90 days of installation. Jurisdictions where warranty benefits cannot be conditioned on registration will receive the registered limited warranty periods. Please see warranty certificate for further details and restrictions.